Metal flash drive with Your Logo. Available in different shapes, colors and capacities. Low Cost, High Quality. Get a Free Quote. Call: 813-444-9626 for more information. Shiny metal flash drive, made for great corporate and executive promo and gift items. They come in 512MB to 64GB capacities. We provide both blank and custom full color UV printed and laser-engraved flash drives: 512MB, 1GB, 2GB, 4GB, 8GB, 16GB, 32GB, 64GB and 128GB. We provide both blank and custom full color UV printed and laser-engraved metal flash drive in all colors, shapes and capacities in USA and all across the world. Stainless Steel Classic Stick Flash Drive. Metal USB with nice UV full color print or laser-engraved imprint area for logo, artwork, text, photo. Our most popular capacities, 512MB to 64GB swivels — SHIPS 1-3 Weeks, depending on specific branding needs. Aluminum with Clear Cap Classic Flash Drive. Metal USB with nice UV full color print or laser-engraved imprint area for logo, artwork, text, photo. Our most popular capacities, 512MB to 64GB swivels — SHIPS 1-3 Weeks, depending on specific branding needs. Aluminum Slider Classic Flash Drive. Metal USB with nice UV full color print or laser-engraved imprint area for logo, artwork, text, photo. Our most popular capacities, 512MB to 64GB swivels — SHIPS 1-3 Weeks, depending on specific branding needs. Aluminum Beverage Can Flash Drive. Metal USB with nice UV full color print or laser-engraved imprint area for logo, artwork, text, photo. Our most popular capacities, 512MB to 64GB swivels — SHIPS 1-3 Weeks, depending on specific branding needs. Stainless Steel Cap Classic Flash Drive. Metal USB with nice UV full color print or laser-engraved imprint area for logo, artwork, text, photo. Our most popular capacities, 512MB to 64GB swivels — SHIPS 1-3 Weeks, depending on specific branding needs. Stainless Steel Contour Shape Flash Drive. Metal USB with nice UV full color print or laser-engraved imprint area for logo, artwork, text, photo. Our most popular capacities, 512MB to 64GB swivels — SHIPS 1-3 Weeks, depending on specific branding needs. Stainless Steel Gold Cap Flash Drive. Metal USB with nice UV full color print or laser-engraved imprint area for logo, artwork, text, photo. Our most popular capacities, 512MB to 64GB swivels — SHIPS 1-3 Weeks, depending on specific branding needs. Stainless Steel Swivel with Key Chain Flash Drive. Metal USB with nice UV full color print or laser-engraved imprint area for logo, artwork, text, photo. Our most popular capacities, 512MB to 64GB swivels — SHIPS 1-3 Weeks, depending on specific branding needs. Stainless Steel Metal Swivel Flash Drive. Metal USB with nice UV full color print or laser-engraved imprint area for logo, artwork, text, photo. Our most popular capacities, 512MB to 64GB swivels — SHIPS 1-3 Weeks, depending on specific branding needs. Stainless Steel Classic with Strap Flash Drive. Metal USB with nice UV full color print or laser-engraved imprint area for logo, artwork, text, photo. Our most popular capacities, 512MB to 64GB swivels — SHIPS 1-3 Weeks, depending on specific branding needs. Stainless Steel Clear Cap & Key Ring Flash Drive. Metal USB with nice UV full color print or laser-engraved imprint area for logo, artwork, text, photo. Our most popular capacities, 512MB to 64GB swivels — SHIPS 1-3 Weeks, depending on specific branding needs. Stainless Steel Mini Cap Flash Drive. Metal USB with nice UV full color print or laser-engraved imprint area for logo, artwork, text, photo. Our most popular capacities, 512MB to 64GB swivels — SHIPS 1-3 Weeks, depending on specific branding needs. Stainless Steel Classic Cap with Key Chain Flash Drive. 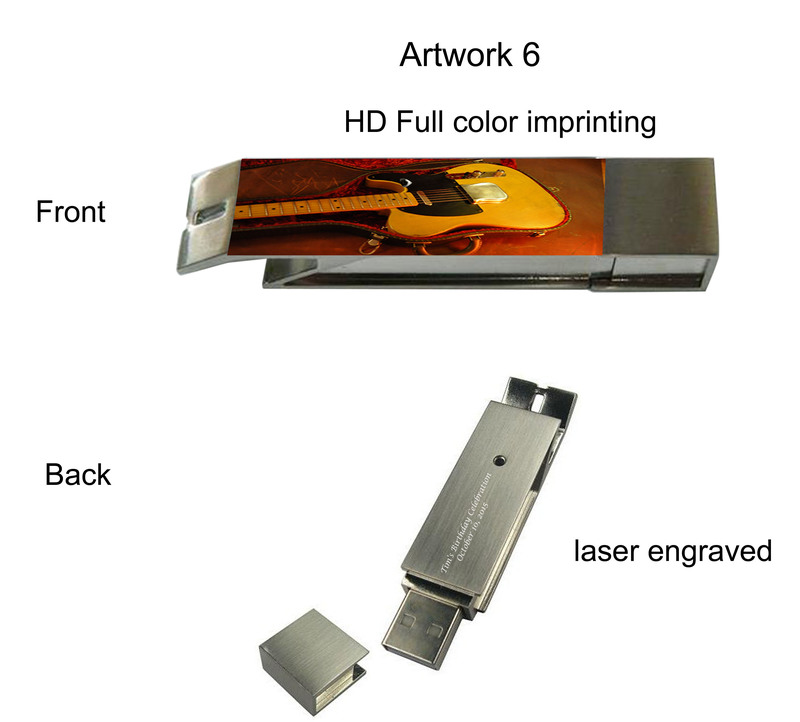 Metal USB with color print or laser-engraved logo, artwork, text, photo. Our most popular capacities, 512MB to 64GB swivels — SHIPS 1-3 Weeks, depending on specific branding needs. Aluminum Cap Classic Flash Drive. Metal USB with nice UV full color print or laser-engraved imprint area for logo, artwork, text, photo. Our most popular capacities, 512MB to 64GB swivels — SHIPS 1-3 Weeks, depending on specific branding needs.